At Dodd & Burnham, our lawyers offer a proven record of success and a commanding courtroom presence when resolving a variety of legal issues. Having handled thousands of cases, we understand the legal, professional and personal implications facing our clients. By combining the skill and resources found at larger firms with our emphasis on personal representation, we offer a different, yet highly effective experience to our clients. We are here to answer your questions and address your concerns. As your lawyers, we will work closely with you to build effective strategies, protect your rights, and achieve your legal objectives. Our network of industry professionals and experts helps us to ensure we have the right people working on your case. We routinely work with our peers in the legal community when referring and receiving cases. 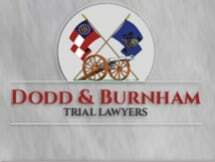 To learn more about Dodd & Burnham and how we can help you, call us at 229-242-4470.